You never realize how incredibly convenient it is to purchase store bought bread until you make the decision to give it up cold turkey. Especially if you are like me: a full-fledged breadaholic who could eat bagettes, boules, loaves, buns, etc starting now until the day I died…and I would die happy. 1.5 Tablespoons of active dry yeast. 2 Cups of warm water (Now a lot of recipes will give you a temp here that the water should be-often between 85-120 depending on what you are making. However, I am far too lazy for that nonsense. It should be warm enough that you would want to take a bath in it but not hot enough that you wouldn’t bathe your 4 year old in it. Capisce?). 2-3 Tablespoons of raw honey (Local if you have it, and it’s ok to add more or less depending on your palate. Don’t go crazy though). Then pour in your olive oil. I tried to make a smiley face with mine, but it didn’t exactly come out right. Now it’s time for what I like to call makingcleaningthekitchenagainanecessity: adding the flour. While I have a perfectly awesome stand mixture that I use for making doughs, I like to do this process manually so I can feel it with my hand. I add a cup and then incorporate that cup before I add more. Don’t feel like the dough needs to look perfect. 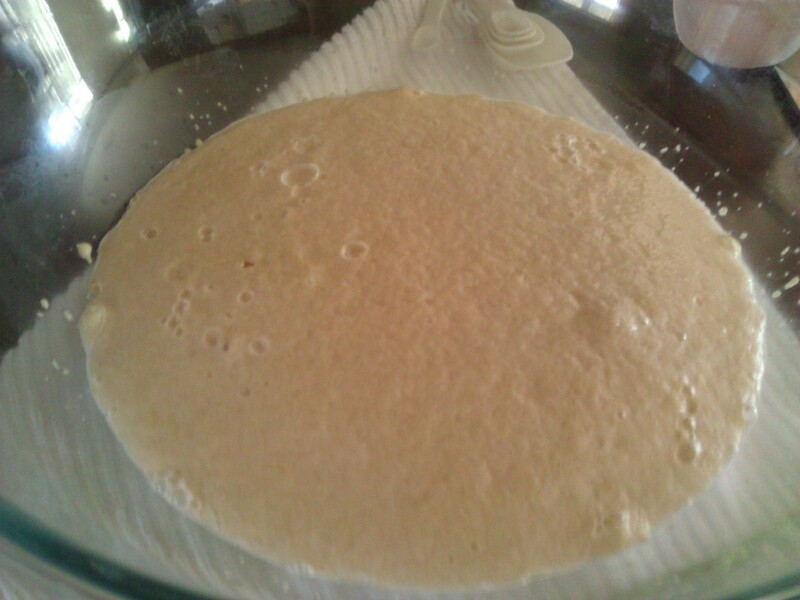 Think pancake batter-you’ll have some lumps and not all of your flour will be mixed in, but that’s ok. Also, you will find that depending on the humidity levels on the day you are cooking, you might need to adjust your flour a bit. You can always add more flour, but you can’t take it away, so once you get to cup 5, start paying attention to how your dough is acting. Once your dough is all in, it’s time to give those biceps a work out. 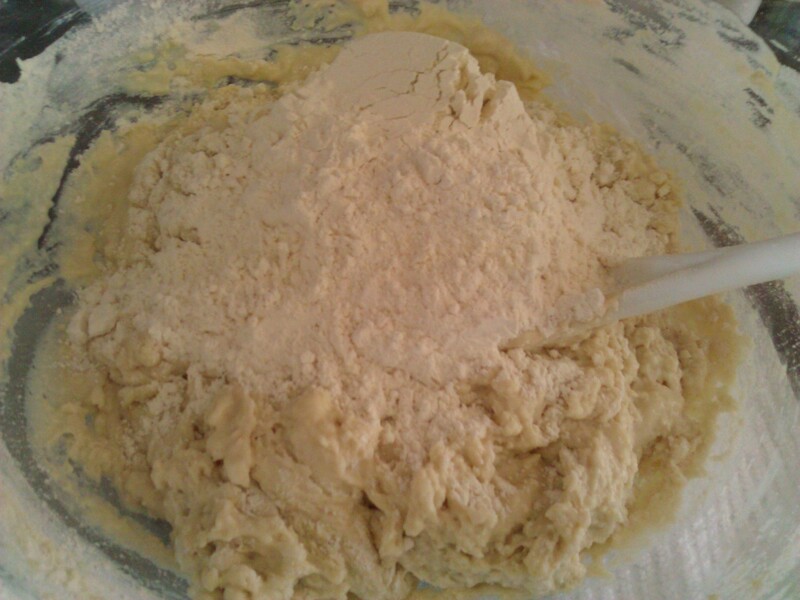 Either prepare a flat, slightly floured surface to knead the dough or be like me and just knead it in the big bowl. I can’t tell you exactly how long you should knead. I try to get to the point where my dough is not ripping when I push it into little balls, but I’m sure others would tell you that there is a better process. For me-that’s what making things homemade is all about…figuring out what works best for you. 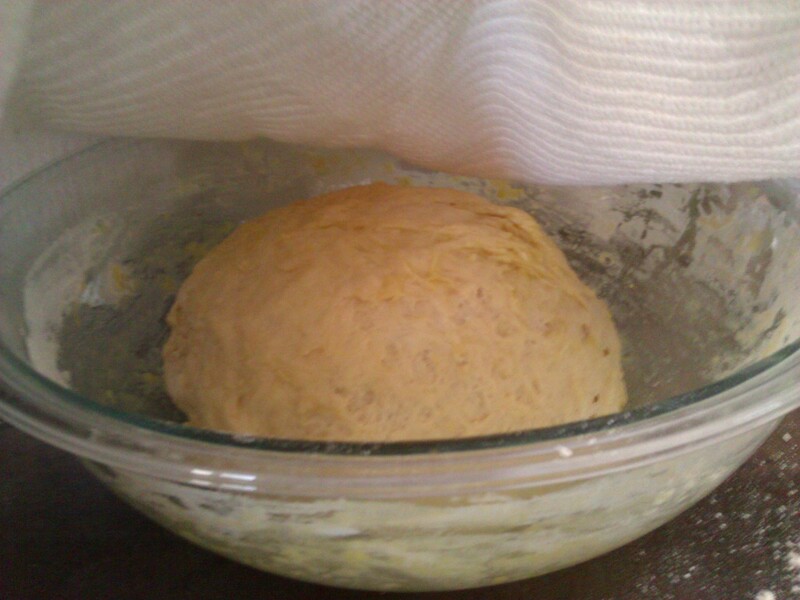 I knead mine until I get bored (which doesn’t last long) and then I let it sit in the same bowl that has been oiled. I cover the dough with oil as well. How much oil? Not deep fry oil, just enough to keep it from sticking. Cover it with a damp cloth if your kitchen is not particularly humid and leave it alone for an hour or so. Then it’s time to take out your frustrations and punch it down. This is not a euphemism peeps. Punch it down. Then cut it into 2-3 portions and let it rise again in a greased bread pan. I typically let it go 20-30 minutes. About 15 minutes in, I start preheating to 375 degrees. Cook for 28-35 minutes depending on your oven. If you aren’t sure if your oven is consistent in temperature, spending a couple of dollars on an oven thermometer would not be a bad plan. Once mine comes out, I take it out of the pan immediately and let it cool off on a baking rack. Actually, that’s a lie. Sometimes I let it cool off on a baking rack. Sometimes I let it cool off in my mouth. I am a junkie after all. 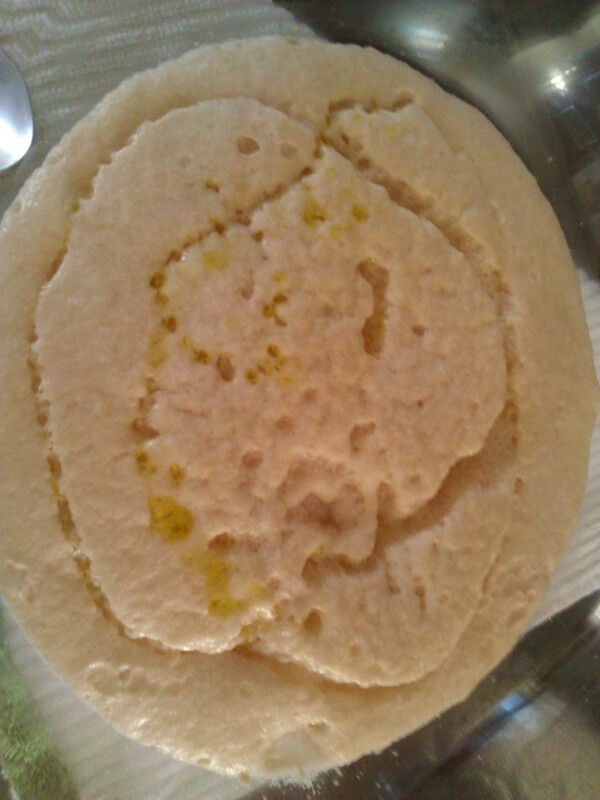 Now, is this bread perfect? Nope. I think it still needs a little more complexity of flavor. 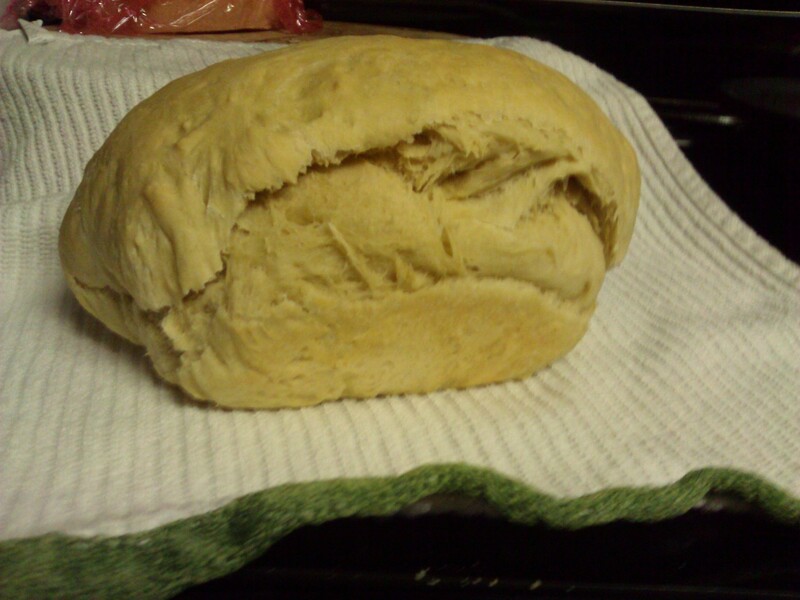 I also think that I got lazy in my kneading because of that Trump-style combover the top of the bread has. However, this is a great, easy recipe that even the most busy of folks can accomplish and ultimately build on. Not including cook or rest time, this recipe probably didn’t take me more than 10-15 minutes tops. So, get out there and try some homemade bread. I promise that once you do, you’ll never go back to that sad stuff in the grocery store again. Happy baking!